Located in the heart of the Great Barrier Reef, the seventy four islands that make up the Whitsundays are perfect for travellers who want to experience a little part of paradise. Most of the islands are not inhabited which makes it all the more exotic. The islands with resorts cater for whatever you want to do. Some resorts are especially family-friendly, while others focus on the luxury market. Others still are based around various sports and outdoor activities. There are many different ways to explore the islands. Some people opt for jet skis or kayaks, while others prefer to view the islands from above by helicopter or seaplane. Sailing or cruising around the islands is very popular. You can rent your own boat (complete with skipper/crew) or go on a commercial excursion. Obviously, one of the most popular activities on the Great Barrier Reef is snorkelling. No matter what island group you choose to visit, you will get to experience the unique sea life. For example, Hayman Island is a great place for snorkelling. This island is located in the northern part of the Whitsunday Islands, and you can reach it easily via boat or helicopter. Hayman Island is also one of the eight inhabited islands out of the seventy four which make up the Whitsunday group, so you have the option of extending your visit by staying in one of it’s splendid resorts or hotels. Situated on the coast of Queensland, Mooloolaba Beach is perfect for a family vacation. Not only is it easy to get to from Brisbane (via public transportation, car or plane) but it has warm weather all year round. 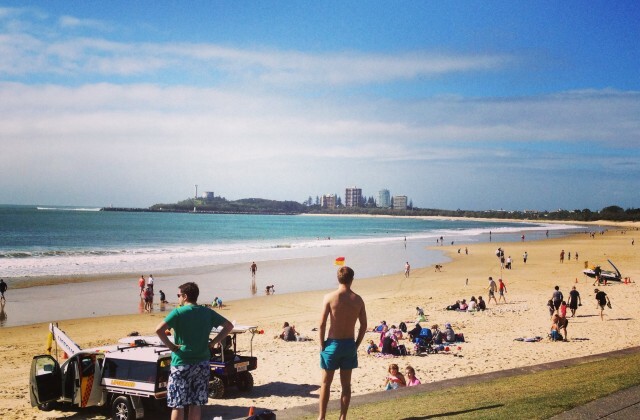 Mooloolaba Beach is one of the safest swimming beaches on the coast, which makes it especially popular with families travelling with small children. There are plenty of things to do in Mooloolaba, whether it be taking a relaxing walk along the beach, shopping, playing a round of golf, going on a cruise of the canals and the Maroochy River, taking a drive inland to the Kondalilla National Park or day’s excursion up the coast to Fraser Island. Brisbane is the capital of Queensland and is situated on the Brisbane River. It is a tourist-friendly city that offers something for everyone. There are many ways in which you can tour the city, with river city cruises and hot air balloon flights being the stand-outs. Tourists who want to learn more about the city’s history can visit the Old Government House (the home of Queensland’s first governors) or the Queensland Maritime Museum (which includes warships exhibits). If you enjoy being scared you might like to go on a Ghost Tour, where you will be introduced to some of the country’s most haunted sites and learn about the urban legends and myths which surround them. For those interested in shopping Brisbane has a large range of shops, from small luxury boutiques on Edward Street to the large Queen Street Mall. Finally, no trip to Brisbane is complete without enjoying it’s tropical flora, so a visit to the City Botanic Gardens and/or the larger Brisbane Botanic Gardens (on the outskirts of the city at Mount Coot-tha) is a must. There are also other parks scattered across the city worth checking out, such as New Farm Park. Known as the oldest surviving rainforest in the world, Daintree Rainforest is also famous for the variety of flora and fauna it contains, particularly endangered species. There are several guided tours available for tourists who wish to explore this rainforest, particularly in the Cape Tribulation area, which is seen as the most important section of the rainforest. Treks of the rainforest floor include both day and night tours to discover the rainforest’s unique species. However, if you’re interested in photography and bird-watching, or if you’re a part of family, wedding, or scientific group, customized tours can be arranged to suit the visitor’s requirements. Outdoor adventure enthusiasts also have the choice of tours that specialise in bike-riding, zip-lining, kayaking and horse-riding. Thanks for the tips! I’ll be heading up that way soon, so it’s nice to get an idea of where to focus some of my attention!